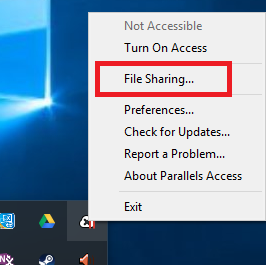 How can I share a file from a remote computer? With the help of Parallels Access you can share a file from your Mac or a Windows PC without using a cloud service. The application allows to create a link to the file on your computer. 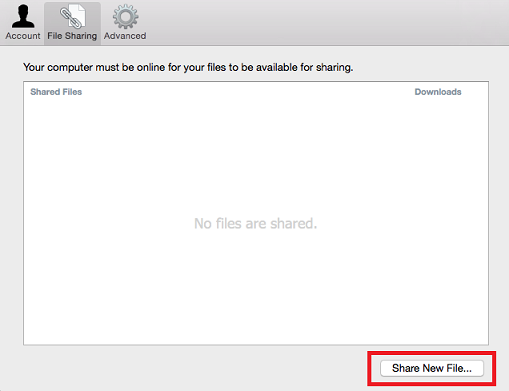 When you share the link, your friends will be able to download the file whenever your computer is online. Note: Parallels Access must be turned on. In order to download the files successfully, stable network connection is required (download speed depends on your internet provider). Click on the Parallels Access icon from the system tray in Windows or menu bar on a Mac, select File Sharing. In the File Sharing tab click on Share New File. In the future this window will contain the history of your file sharing. Select the file on your computer that you would like to share. Next you will see a window where you can add a description to your link, set number of allowed downloads, the link expiration date and add a password, if you would like to make it more secure. When you finish configuring the link properties, click Share. to delete it, i.e. disable it. In this window you will also see the number of times the file has already been downloaded after you shared the link. When the shared link is opened, the page will ask for the password, if you set it in the link properties. After entering the password, or if no password was set, a user will see a page with a download link for the shared file.